Luke’s prologue has a distinct style using Greek reason – an appeal for response based the examination of evidence, comparative testimonies, and eyewitnesses. He clearly states his desire and intent (v.3) and states his convictions about the nature and purpose of Jesus and his understanding that is is the Christ foretold in the Old Testament. In a similar way, we want to be clear about our desire for you as you begin this study. Its our desire not only that you come to the faith – confident in Jesus’ teaching; but also that you begin or continue your journey as his disciple; and prepare yourself to live a life of ministry that glorifies God and bears much fruit. If you were writing a memoir testifying to the experiences and lessons you’ve learned and heard from Jesus and others – what would you include? With whom would you want to share it? What purpose would it serve? What spiritual benefits would you want them to receive? Who has passed on the faith to you? What have been the most important lessons thus far? Luke indicates that he himself was not an eyewitness to the events he writes about but that he researched each of these accounts and others carefully. Presumably, he made personal interviews with the some of the individuals who were present including the other Apostles. Luke probably became a believer in Antioch of Syria (Acts 13:1) through the ministry of Paul. Luke is a Dr and a remarkable historian. He was not writing a theological discourse or bylaws of a congregation. None of the Gospels aim to do that. He was penning what he thought most important and surely true after sufficient research and testimony. The Greek style of this phrase is a manner of presumptive close or call for action. Since these things are true, take action. Luke is perhaps speaking directly about the journeys, acts and teachings of Christ as recorded in his Gospel, however accepting such means also that Jesus is the CHRIST, the MESSIAH who fulfilled the OT prophesies that are evidence of his nature and all that will happen next. Download PDF: “Messianic Prophesies fulfilled by Jesus“. The first eyewitnesses: John the Baptist, Andrew, Simon, Phillip and Nathaniel, John the Apostle, the other Apostles, and the countless thousands who met the Messiah, heard his teaching, witnessed the miracles, heard his parables, and saw him crucified, risen and ascending. Note that the disciples (I’m not speaking here of the peripheral followers) took on a new purpose in life. The term members is to be incorporate with the body of Christ, to fulfill the purposes and will of God and, as are the members of our corporal bodies, become servants of the head – that is Christ. 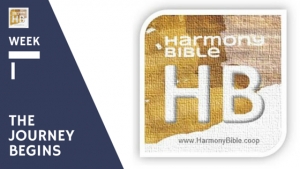 So should it be in the church today – and Harmony Bible itself when we speak of membership. mentioned here in Luke 1:3, and also Acts 1:1 He was a real person, a disciple of Luke. Perhaps later he became an official. The tone of Luke’s pastoral introduction to this gospel and second mention of his name in Acts seems more than enough reason to accept that he was a real individual not simply the poetic name given “friend of God” or “loved of God” to speak to all who share the meaning of his name. Certainty – What are you certain about? Certainty in the faith forms our worldview, controls some measure of our emotions, our actions, and intentionality. So often today, church leaders provide topical lessons in classes and sermon series, some take an exegetical approach book by book. Our conviction is that we must first disciple new members with a solid understanding of the lessons Jesus taught his disciples. Discipleship is not a process but a relationship. While our own methodology involves four years of study through the Gospels following five phases of Jesus life, and learning outcomes (which we’ve assembled to into a list), the journey of each disciple is unique. Our spiritual vocation, gifts, talents, life experiences and behavioral make up causes the one making disciples to take special concern for the finished work of that individual disciple. Think of it like a sculptor working on a piece of stone. Discipleship is not accomplished with the completion of a four or twelve week series. It is a lifelong journey and relationship for both. See “Learning objectives” in Five Phases of Discipleship. Theophilus had heard other teachings in his life. Not only were there the maxims, values and priorities which his parents had most certainly impressed upon him, there were probably other Christians who had shared what they knew and what they had heard. Similarly, each of us have had a number of teachers in our lifetime. Luke is stressing his own pastoral (Hippocratic) concern that his disciple Theophilus, hear the truth, fashion his life accordingly – to be a disciple who makes disciples. The available historical evidence of other writings at this time is uncertain. Luke wrote this Gospel between 50-60AD which is no more than 30 years after Jesus was crucified. In fact, by the end of the first century all the books of the New Testament had been written. By 140AD before any “institutional church” the four gospels were widely accepted as the paramount accounts of Christ’s life and ministry. While other Gospel accounts emerged later they did not compare in stature to the four Gospels we have today. Luke writes the longest gospel. The earliest known harmony is the Diatessaron by Tatian (c 160–175) and variations based on the Diatessaron continued to appear in the Middle Ages.